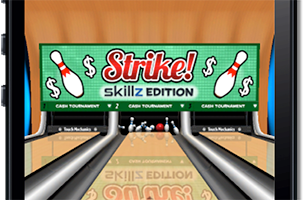 Real-money gaming company Skillz has announced the official launch of its Skillz SDK for iOS devices, which allows developers to add real-money tournaments to their skill-based mobile games. The platform was released in beta on Android in April 2013, but launches today on iOS with more than 300 game studio partners and over 150 supported games already live on the App Store. Since the Skillz platform focuses on player ability, rather than luck, these competitions avoid the restrictions associated with gambling or other luck-based pastimes. In fact, cash competitions in skill-based games are legal in 37 US states. The Skillz platform is growing rapidly, both in participating developers and active gamers. The platform has passed 1.5 million user accounts, a number Skillz says doubles “roughly every month.” Early partners in the program are generating more than 20 cents in incremental revenue per daily active user, or ARPDAU. Some of the platform’s supported games include Real Money Pool by Coeus Creative, Mini Golf 3D Putt Putt by DMW Design Group and Strike! Real Money Bowling from Touch Mechanics. Skillz says its 300+ studio partners are responsible for more than 2,700 games which have been selected for the platform, with Skillz as their exclusive partner.